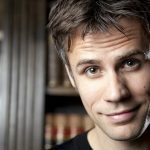 Richard Bacon, broadcaster, journalist and author, a man renowned for his highly entertaining, cheekily unswerving, interviewing style. Following a controversial stint on the children’s series Blue Peter, Bacon moved up to ‘grown up’ broadcasting, hosting The Big Breakfast, BBC 6 Music, Capital FM and XFM. Bacon’s impressive showreel includes presenting: Channel 4’s ‘Hidden Talent’, ‘Frontline Afghanistan’ (a BBC documentary about Prince Harry’s army tour) hosting BBC’s ‘The Big Picture’, writing and presenting the globally acclaimed ‘Anti-Social Network’, as well as hosting two of BBC Radio Five Live’s most successful shows. As an interviewer, Bacon has grilled (but never roasted) Prime Ministers, film stars, authors, comedians and many more luminaries. The legendary David Frost described Bacon as one of the “most stimulating interviewers working today”. A prolific online and offline writer, with pieces regularly appearing in publications such as Esquire and the Sun, Bacon’s Twitter page attracts over 1.5 million followers. His first book, ‘A Series of Unrelated Events’, charts his chaotic life, which includes being crowned number 1 in the NME’s rundown of the most ‘f*cking useless people in the United Kingdom’ – just ahead of David Cameron. Bacon’s charisma keeps audiences enthralled and entertained. Commenting on Bacon’s hosting skills, BBC Worldwide said: “Richard was absolutely fantastic”. His previous corporate work includes hosting the POPAI Awards, The T3 Gadget Awards, Puig Fashion and Fragrance Awards, as well as being a guest speaker at an Action for Children Dinner. Richard is presented by Specialist Speakers in association with COBJ.